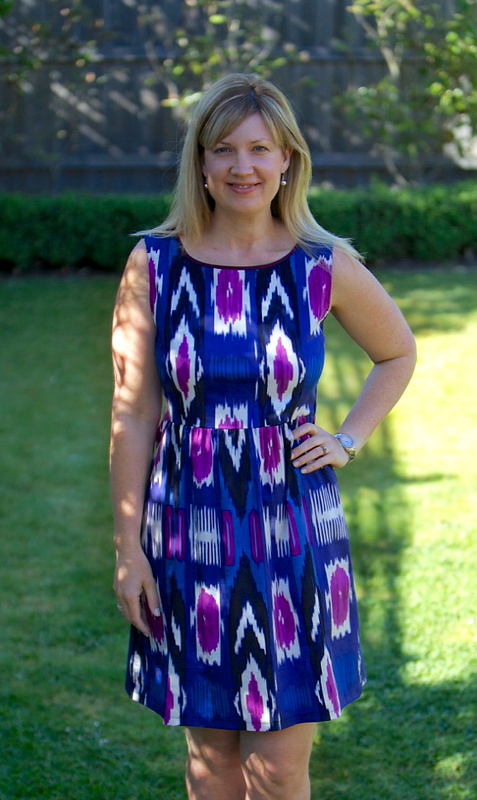 Welcome to Friday’s Frock and yes, it is already week four of Frocktober! 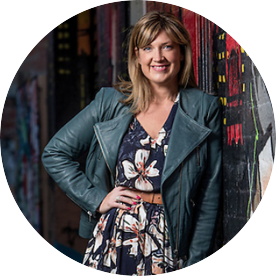 This week’s frockery comes to you fresh from the market. The Finders Keepers market, that is. If you haven’t been before, Finders Keepers is an indie art and design market which travels to Melbs, Syds and Bris Vegas. (Upcoming market dates are here). Anyhoo, I had the pleasure of popping along last weekend and was not disappointed. It was fab as usual, but this time around, I must say I was rather struck by the fabulous fashion on offer. One of my faves being Kindling, a local Melbourne label created by sisters Nina and Lydia O’Brien. At Kindling, the focus is on pretty, retro inspired dresses made from gorgeous fabrics. Each dress is hand made and has a quality finish. 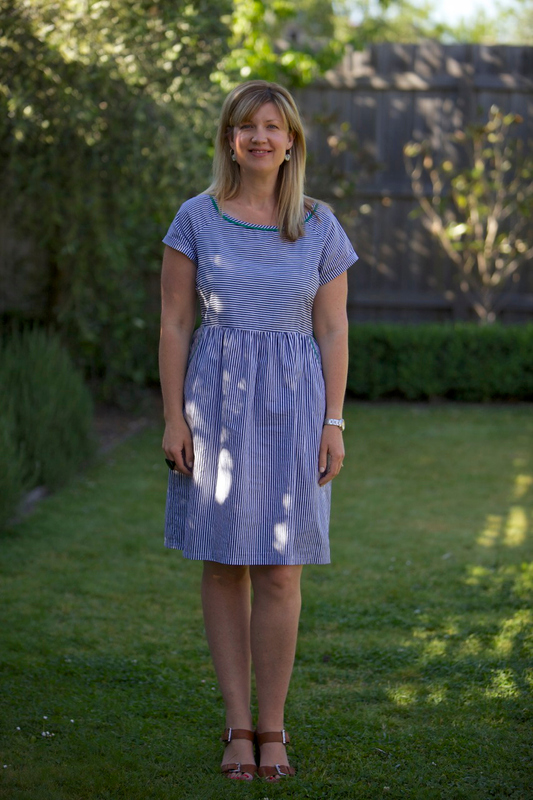 If you like a sundress that is a little bit different and like supporting young designers, check out Kindling’s great range of frocks, skirts and tops. They even do a range of cards and prints. Talented ladies indeed. So, I had a chat to Nina about this year’s range and we decided that the following two frocks looked the business on me and she kindly gifted one of them to me. Thanks GF. 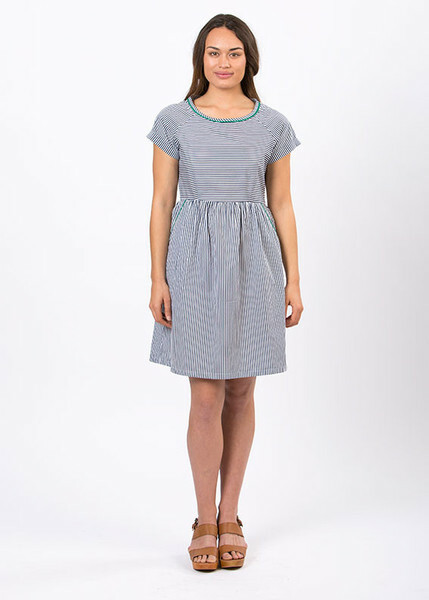 Here’s the first one, which is an oversized casual dress – the Stripe Dress. With it’s navy and white stripes, green piping and frockets (aka pockets) this frock will be on regular rotation this Spring and beyond. And they are functional pockets too – I can fit the garage remote, $5 and lego in the pockets no probs. I’ll be pairing it with my navy salt water sandals by day and my tan block heels for casual evening dos. I’m wearing size 14 because I prefer this style oversized. The second frock is the Ikat dress which looks shorter here on the model than I think it actually is. In my size 12, it comes a good three inches above my knee. On me, this frock will necessitate a spray tan and heels but for my shorter sisters, this will be fine for day or night. I just love this print and the fabric has a smooth, almost silky finish. The print is striking and breaks up my navy heavy summer wardrobe just nicely. Is anyone else obsessed by navy at the mo? If you’d like to see more of me wearing Kindling, I’ve previously worn Kindling’s Hello Sailor dress in this post and more recently, here. I also have their David Loves Flowers skirt which is now on sale. To keep up to date with Kindling’s new designs/sales/markets, make sure you follow Kindling on Facebook or Instagram. If you are in Melbourne, mosey on down to their brand new bricks and mortar store at 93 Johnston Street, Collingwood. Have you been to Finders Keepers before? Do you love finding new, local designers? 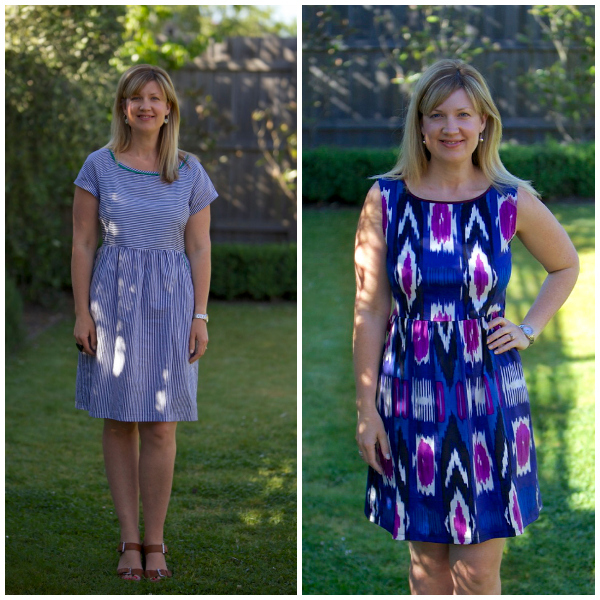 Can you see yourself rocking one of these two frocks? Is anyone else’s summer wardrobe full of navy?